On Thursday (18th April) we will be at our yellow hut in Mayflower Marina from 4:30pm – 5:30pm for this seasons cadet registration. You can pop down to say hello and hand in your forms or come and register so its not as hectic when we have our first on water session. 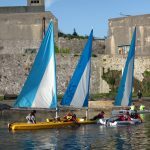 To join the sailing club you need to be aged 8-19. We will ask you to read the Code of Conduct, complete a Sailing Club Membership Form and drop it in to us. You can also post the forms through the letter box at our office (5 Richmond Walk) any time you’re passing. Sailing Club sessions will start on Thursday 25th April 4:30pm-7:00pm, and Sat 27th April 9:00am-12:00 noon. Please remember all club sessions are weather dependent. We will post on our Facebook Page and send you a text message (if you have ticked the box on the membership form) if we need to cancel a session.